This method of creating planting beds is similar to raised beds in some ways. In this approach, the soil is deeply worked not with a plow, rototiller or harrows, but with shovel and/or pitchfork (but be sure to check out our Update below). The approach works best when combined with planting beds as opposed to single-row or wide block plantings. 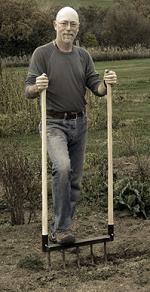 The double-dug method is aptly named because the simplest technique is to dig down two spade or shovel blade depths. The first spade depth is actually lifted and removed from that section of the planting bed (and returned later either into the previous section, or at the end of the bed). Then once that first spade depth worth of soil has been lifted, a second spade depth (or pitchfork depth) is worked loose to allow extremely deep root penetrations. 1) a tremendous amount of air is mixed into the soil when digging and moving the various blocks of soil. If the planting beds are not subsequently walked on, that extremely loose soil stays well aerated throughout the growing season. Plant roots, soil organisms and water also have an easier time moving through the soil for better nutrient availability. 2) Various slow-release soil amendments can be introduced when the bed is dug, instead of merely spread on top or side-dressed alongside the roots. This thorough mixing thereby brings these otherwise slow-to-sink-in materials directly into the root zone. 3) this method almost invariably also raises the planting bed, resulting in all the same benefits as those listed under the Raised Beds page. But in this instance, the depth of that fine soil goes deeply down below grade, instead of merely resting on top of ground level. 4) This approach creates the finest seedbed I've ever had the pleasure of working with, bar none. I've never approached this fine and uniform a seedbed consistency with any other manual or mechanical cultivation method. It's a pure joy to work with. 5) When beds are repeatedly double-dug, they become easier to work over time. Reportedly, soils which have been double-dug for many years get to a point where they don't need to be dug anymore. We're not there yet. * As in other forms of raised bed gardening or farming, the plants are concentrated in one area instead of having aisles or walkways between each row. * The raised bed surface provides slightly more planting area than the flat grade surface would provide. While per-bed area may only be slightly larger than a flat bed, add up all the beds' additional area and it could add up to another bed worth of growing area. * Super-close plantings dramatically reduce weed competition for water, light and nutrients. All the resources in the environment are then available to the desired crops. 1) this method can be fairly strenuous to build. If you have 100sqft of planting bed to prep, that's a half-day of solid work but it's do-able. If you have 10,000 sqft of planting area to prep, you either need to bribe some friends, hire some help, or start digging your beds in autumn (which isn't a bad idea in and of itself). But you'd never be able to prep that much ground by yourself in springtime with shovel and fork, and still get anything else done. 2) There are soil scientists, organic growers and traditional gardeners who would all protest the mixing of various soil layers. This method does not seem to create the dreaded rototiller hardpan below the dug area, but mixing those soil laters is a no-no according to these folks. I honestly don't know how big a problem that is. It may depend on the soils you're working with. We have never see problems with mixing those layers here but that could just be our own individual site characteristics. 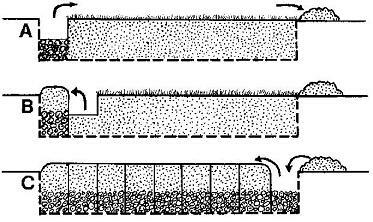 3) If you have shallow soils, ie 24" deep or less between surface and bedrock, water table, clay or some other undesirable layer, you may be better served to build the soil up rather than dig all the way down to that barrier. Large stones and boulders at those lower depths can also create real headaches, either to move or to work around. Shallow tillage could avoid those obstacles entirely. When we first got started, we used double-digging almost excusively because we liked the seedbed so much. And we only had a relatively small area to prep. But as we have grown in size of tilled area, we have sadly waved adieu to this method. Since I generally work the ground by myself, it simply became too labor-intensive to prep all our beds in this manner. But I cherish the double-dug beds that we still use because they are always the first to warm up, the easiest to work and yield the happiest plants. I continue to revisit the idea of how to somehow double-dig more beds so as to enjoy those benefits. The only solution I've come up with is to work the ground in autumn as I have the time, and rotate through the beds such that I don't double-dig them all every year, but I try to double-dig each bed at least once every few years. That's not ideal, but it does provide at least a measure of all the method's many benefits without quite as steep a labor cost. We have recently become aware of a tool called a broadfork that may allow us to continue using this planting method, without the fatigue we've experienced using shovel and fork. The broadfork is a tool which has been used in a variety of cultures around the world to deeply dig the soil in a manner roughly consistent with the double-digging method described above. The main advantage with the broadfork is that instead of using shoulder and back muscles to dig, lift and mix the soil, you actually stand on the tool and rock backwards, such that your entire relaxed body weight moves the soil instead. The fact that these tools came into existence repeatedly around the world tells me that our concerns about this planting method have been experienced, and answered, by others throughout history. Information like that tends to make me stop and take notice. Another concern we had was that such a tool would be even more prone to breakage, if a person's entire body weight was lifting the tines. Yet there may be an answer to that as well. A professional blacksmith by trade, and gardener by hobby, developed a broadfork with replaceable tines in case one of them broke during use. This particular model was also built for extensive use. The inventor of this particular broadfork used traditional designs, but made it robust enough, and comfortable enough, to use throughout the growing seasons, for many years. Such a robust, yet user-friendly tool, could make the difference for us as we explore ways to continue using this method even as our growing area increases. We'll keep you posted as we test this possibility. To read more about this broadfork, visit Gulland Forge Broadforks. While double-digging and intensive planting are both fairly generic methods, in use under various titles around the world, few people have worked as hard to promote this combo as John Jeavons of Ecology Action in California. His book How to Grow More Vegetables... has been a classic in sustainable gardening and farming circles for decades. It has also been translated into a number of languages and served as a textbook in many nations. If you ever wanted a thorough introduction to what's really possible in soil-based gardening or farming, his book would be hard to beat. The fact that he's helping countless villages to feed themselves and their nations with this approach just makes it all the better. If I knew in advance I'd be stranded on some desert island, and I was given a single book to take with me, it would probably be this one. I can't recommend this book highly enough.